Today, there are multiple injectable wrinkle treatments on the market for you to use to get a more youthful, refreshed appearance. The Radiesse injectable wrinkle treatment offered by Novo Med Spa is great for mild to moderate lines and wrinkles throughout the face, and for fixing age-related volume loss in the hands. Women and men who might not have a lot of time for repeat appointments appreciate the long-lasting results (1 – 2 years) of Radiesse. Using calcium hydroxyapatite microspheres in a water-based gel, this injectable plumps and softens the look of your skin without the time and expense of surgery. 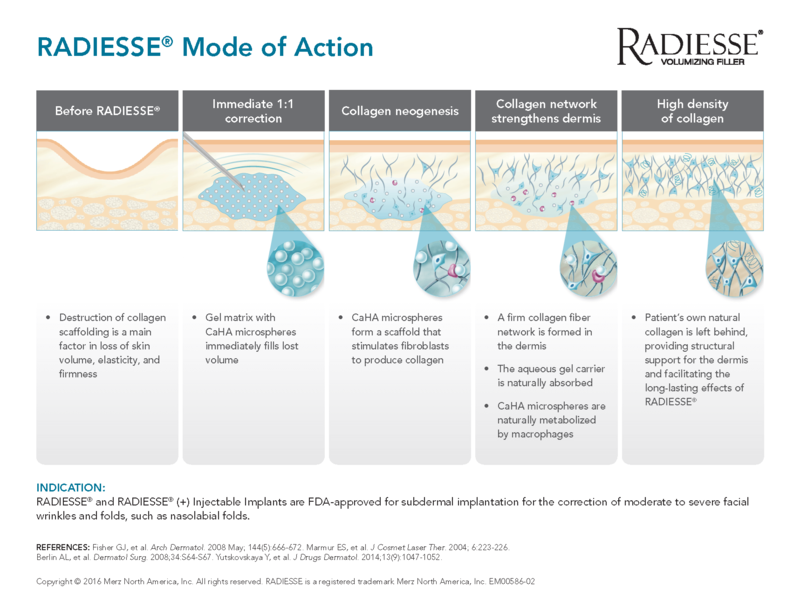 Radiesse has been approved by the Food and Drug Administration (FDA) to safely and effectively contour your facial features. It can be used in tandem with other injectables (wrinkle relaxers and fillers) for a unique procedure plan that restores your skin. Look refreshed and boost your confidence with Radiesse injectable wrinkle treatments at Novo Med Spa in Frisco, TX. Women and men who are in good health and want to correct their mild to moderate wrinkles and lines are ideal candidates for Radiesse injectable treatments. It can improve smile lines, marionette lines, pre-jowl folds (jawline contouring), chin wrinkles, and lines in the edges of the mouth. 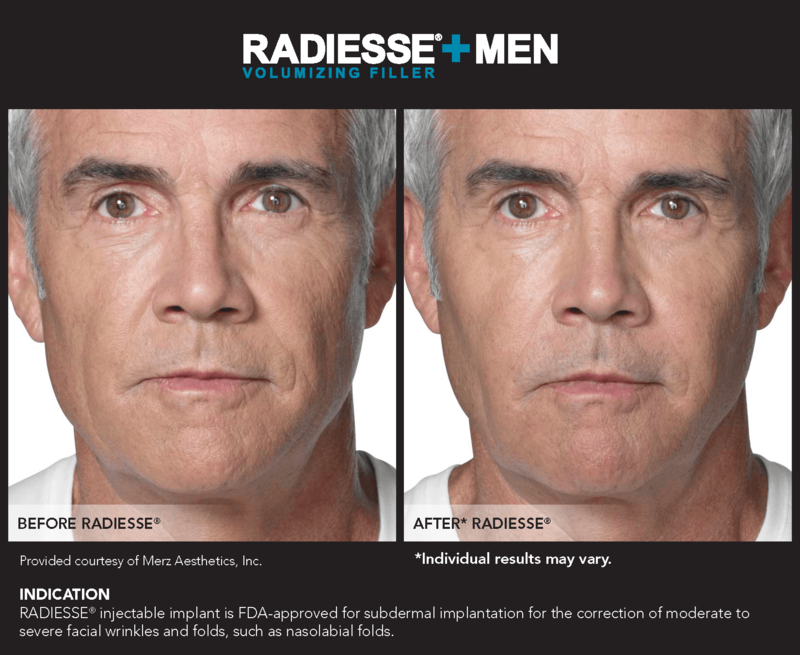 Radiesse is also designed to treat age-related volume loss in the hands to help them appear fuller and younger looking. In addition, it can be used for cheek augmentation, chin augmentation, and as a temple filler. You should not have this injection if you are allergic to lidocaine or any ingredients in the product. Make sure to let our team know about any allergies (severe or not) and your medical history. If you are breastfeeding, pregnant, may be pregnant, or are considering pregnancy within 1 – 2 years, you should not use Radiesse treatments. Radiesse wrinkle injections are performed in one of our private treatment rooms at Novo Med Spa in about 30 – 60 minutes after the consultation. At the start of your session, the areas of injection will be cleaned and marked. Most patients feel minimal discomfort during their treatment at the initial injection, but if preferred, a local anesthetic may be used to ensure optimal comfort. The dosage of Radiesse used to attain your cosmetic goals will be determined at your consultation and will be carefully administered to the designated areas. As soon as the procedure is done, a cold compress will be applied to help reduce swelling and bruising, and you will be free to return to your usual activities. 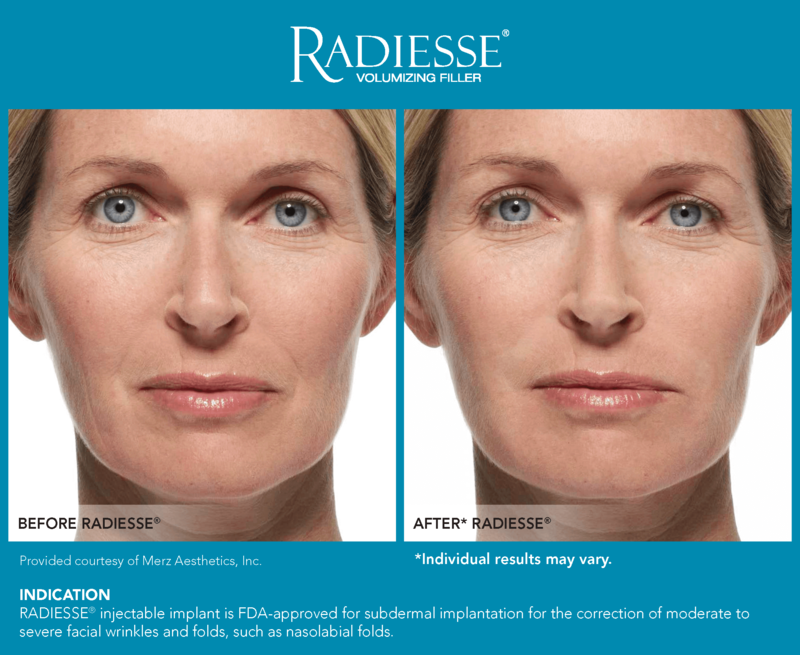 After your Radiesse injection, you may see mild swelling, bruising, and redness. This is common and should only last for about 5 – 7 days. These side effects can usually be camouflaged with makeup. If the symptoms last longer or seem excessive, please do not hesitate to call Novo Med Spa. Most patients see noticeable results just minutes after their treatment with better results developing over time. Your face should appear younger, softer, and lifted. 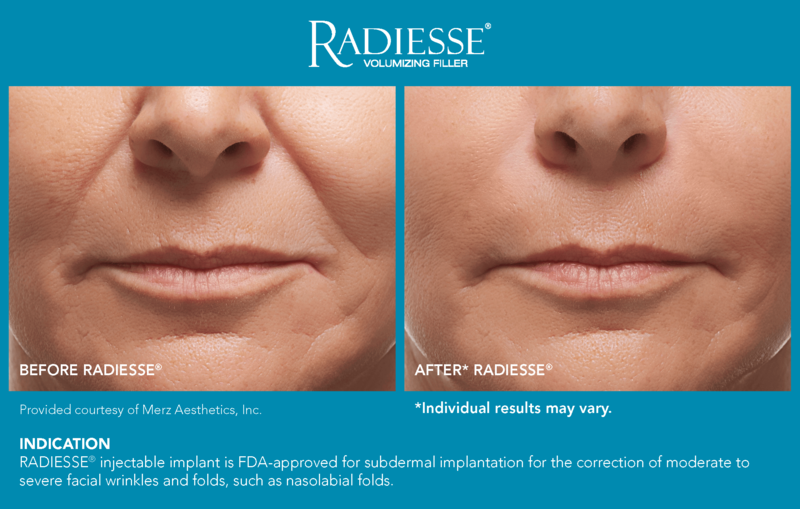 Radiesse tends to last longer than some of the other fillers — about 1 – 2 years. You should talk to our team during your consultation about when to schedule your next treatment to maintain your results. 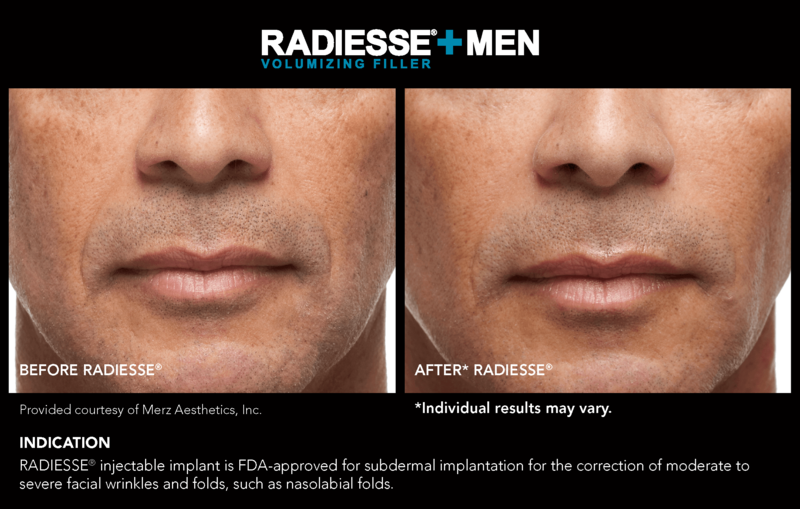 As an injectable dermal filler, Radiesse gets positive reviews from our patients for creating wonderful results. If you would like to learn about the benefits of Radiesse wrinkle treatments, please call Novo Med Spa in Frisco, TX today to schedule an appointment with our highly trained cosmetic team. Our staff members pride themselves on providing comprehensive and quality aesthetic care to each of our patients.